This article however moves to further explain both the reason for the Tunnel and the other components that go to exploit it's potential. The original Sidepod Tunnel concept had a cutout in the sidepod ramp with a linear height of 50mm from the floor which utilizes the minimum radius rule. This concept had the Tunnels airflow exit just aft of sidepod ramp in order try and assist the airflow toward the coke bottle region. Red Bull have experimented with other iterations exiting inside the engine cover in the same way their new tunnel/duct system works but have always had a problem with airflow attachment. The new version (above) continues to use the 50mm radius rule at the rear portion of the tunnel but is separated from the the frontal section of the Tunnel by a vertical section of bodywork. Forward of this seperation the height increases and reminds me of the Ferrari Acer Duct in the way the bodywork hangs over the floor. These two tunnels combine and merge atop of thefloor in ducting which exits at the rear of the car (See Below). 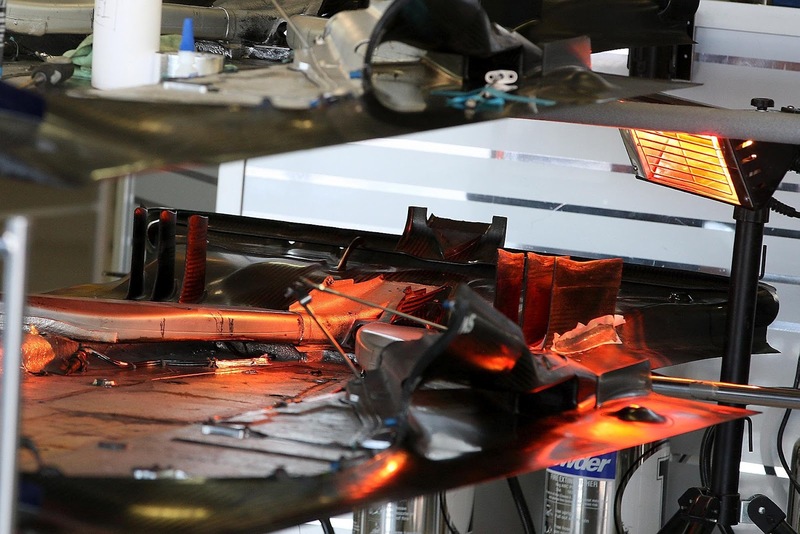 Above: These pictures shows the floor of the car, the silver ducts are the tunnels that lead from the Sidepod entry to either the outlets in the the engine cover at the rear of the car (Coke Bottle Region) or to the starter hole. The other alternative is that the first tunnel entrance simply merges with the airflow from the engine cover and exits out of the lower cooling hole. Leaving the later tunnel entrance to flow airflow through the duct and out of the starter hole. This Tunnel section adds a new dimension to the airflow pattern giving the airflow from the exhaust plume a further means of interacting with the diffuser. Without the means of a better way of describing it, this concept adds another deck. Although not in the same direct way as the original DDD's (Double Deck Diffusers) as it's not part of the diffuser itself, it will increase the effectiveness of the diffuser. Due to the way the 3 flows interact (Diffuser, Tunnel & Over bodywork) the diffuser is sealed much further outbound than has been possible so far this season. Being able to seal the diffuser is imperative to the way in which the tyre squirt interacts laterally with the diffuser flow, providing more balance for the driver. 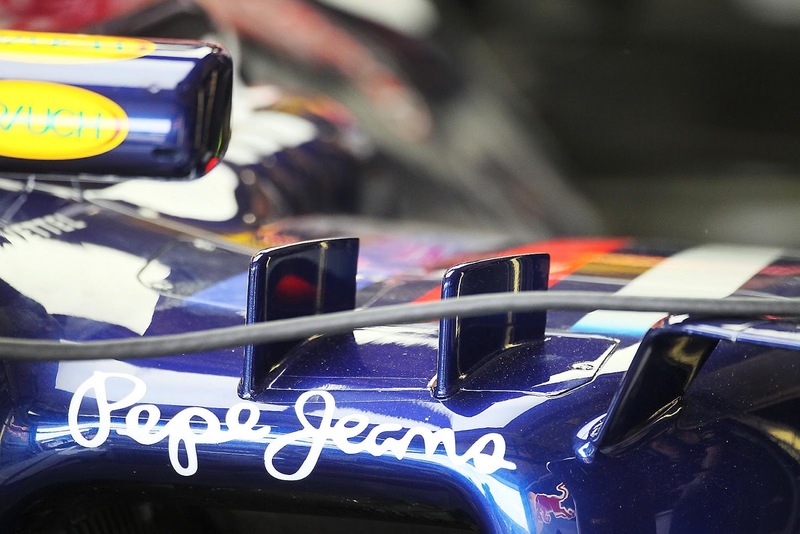 Red Bull are further managing this effect with diffuser strakes that turn outward, this allows the flow emitted from the tyre to be straightened and minimize the tyre squirt into the diffusers main airflow channel. 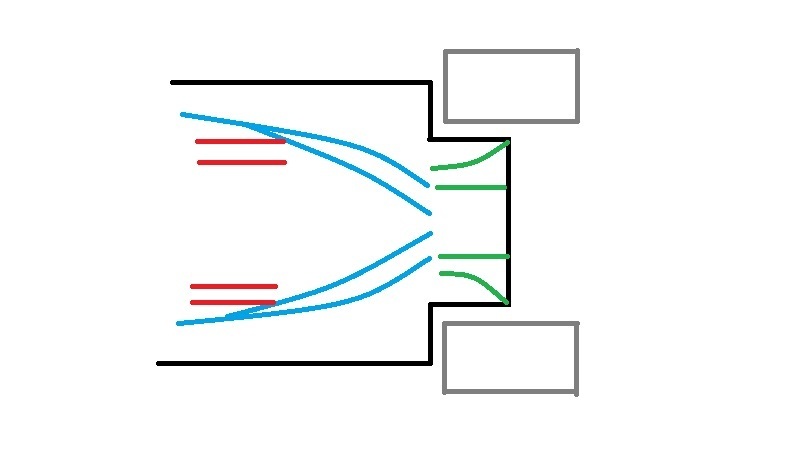 If you have a look at my crude representation above I have marked the diffuser area (strakes) in green, the tunnel(s) are shown in Blue and the exhaust channels are marked in Red. 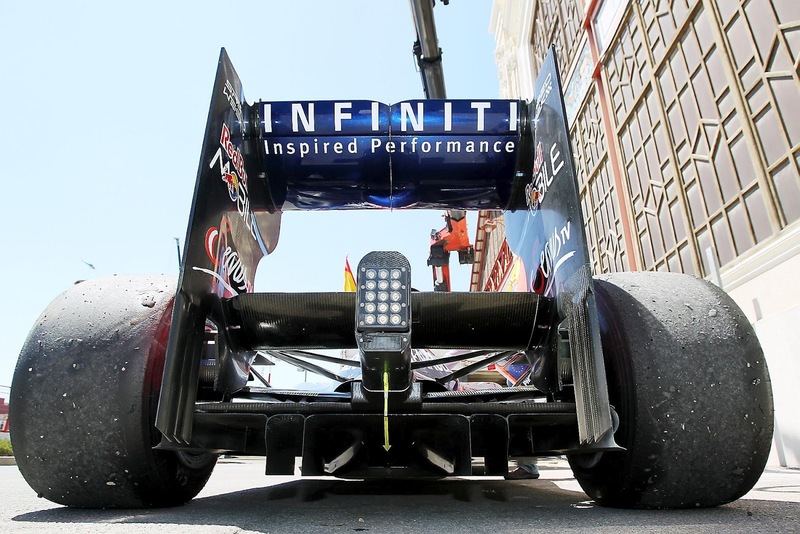 As we can see below from the Australian spec RB8 the original intention was that the airflow from the exhaust and tunnel would converge above the floor and exit through the centralised starter hole. 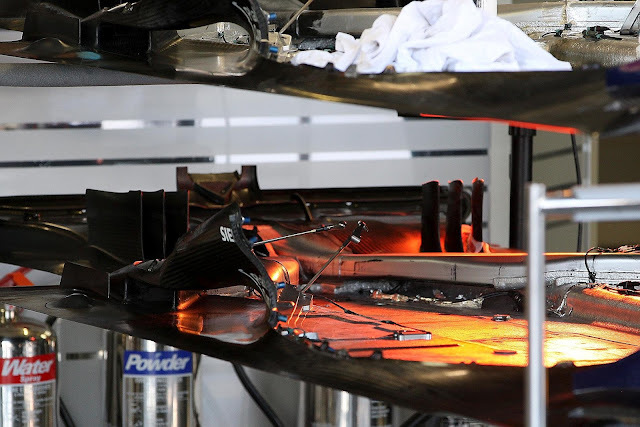 Creates another element in which to turn airflow and manage the airflow coming over the bodywork towards the rear of the car. Encloses the driveshaft, this removes the Magnus Effect on the exterior airflow. The Magnus effect can create lift something you want to reduce in this area as it will have an impact on the air you are trying to generate downforce with. More importantly though due a massive boundary layer build up it can create a huge chunk of drag too. Not being able to divert the exhaust gases in a precise manner means you would like to control the airflow aft of the exhausts as much as possible. Reducing the effects of this spinning element from the equations especially in such a critical area may be a shrewd move by Red Bull. I believe that all of these factors in combination are the reason for Red Bull's leap in performance. They also tie in to the decrease in tyre wear that Sebastian and Mark had at Valencia. More rear downforce = a more stable rear end and will help reduce tyre degradation. This current configuration has only been developed due to Adrian Newey and Red Bull's determination to make the original concept work, meanwhile they have inadvertently come across a much stronger version of the original concept. If we see the strakes, floor and driveshaft cowls as one unit they give the appearance similar to that of the diffuser below which should enhance the diffusers airflow profile. I hope for the sake of the close championship battle we are currently seeing that the other teams already have similar concepts in development. As this in my eyes is not simply a one off for Valencia and will continue to provide Red Bull with a large gain over the other teams. "Due to the way the 3 flows interact (Diffuser, Tunnel & Over bodywork) the diffuser is sealed much further outbound than has been possible so far this season. Being able to seal the diffuser is imperative to the way in which the tyre squirt interacts laterally with the diffuser flow"
I do not appreciate this statement, can you expand. 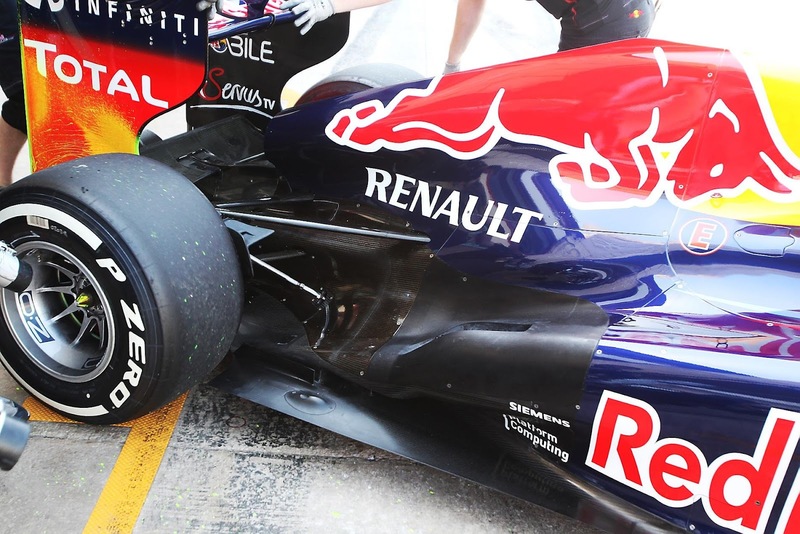 I do understand how the new duct system has anything to do with seal the sides of the diffuser or managing tire shirt. The three flows I mention are working in unison to try and replicate the EBD airflow pattern IMO. The tunnel is acting almost like the extra deck space did on the DDD's only the airflow isn't being robbed from the expansion area of the diffuser allowing for potentially even more airflow to be pulled through the diffuser as a result of the increased airflow above. In regard to managing tyre squirt, attributing additional flow to the central section of the diffuser will aid in straightening the tyre squirt further out as it pushes laterally towards the diffuser flow. Actually the Magnus effect creates downforce when the car is moving forward. I have edited that section to be more expansive. The problem with exhaust plume manipulation is it isn't an exact science and although CFD and Wind Tunnel can show one result in the real world another may be attained. Flowing the exhaust plume into the rotational force of the driveshaft may move the stagnation point and create lift instead of downforce. As I've mentioned in the more expansive section now perhaps the loss of the drag incurred in this region has more to do with why they decided to cowl the driveshaft. Thinking laterally I'm still inclined to think their is a large reason behind RBRs use of the cowl and that it must create force in another region ie the ejector holes on the underside of the cowl. I do not believe those are "ejector holes", i think what you are seeing is merely a reflection of the three top of floor mounted vanes/strakes (clearly visable in the first floor off tunnel entry hole picture) on the underside of the driveshaft cowling. I also dont think the cowlings are doing anything particularly exotic. If you look at the rear end pictures of the car, you can clearly see that the driveshafts and differential outputs from the transmission are wide open and exposed. The cowling doing nothing more then sheathing the outputs shafts. So there doesnt seem to be any closed system to force air out of an ejection hole further up the cowling. My educated guess is that the cowling is simply being utilized to remove any potential unwanted magnus effect from the spinning driveshaft having an adverse effect on the surrounding aerodynamic elements. So its not so much creating an effect for a solution, or providing a solution to a problem, as much as it is simply preventing a problem to a solution by making the driveshaft as aerodynamically invisible as possible. I agree that they do look like reflections of the strakes and did ponder whether to actually post about the ejector holes because of that. However sometimes I feel that you need to get these thoughts out there to spark the debate and see what others think on the subject. I'm going to look back through photos from previous races later when I'm at my laptop and not iPhone to try and substantiate the ejector hole situation. As you say and I have added in my comments above the cowl is more likely there to nullify the Magnus effect. Well, while we are on the subject of throwing out ideas, and sparking debate, how about this? And looking further at pictures of the floor, and the placement of the tunnel openings. It looks like the smaller, rearward, square opening tunnel is the one being ducted, and feeding down into and blowing the starter motor hole to energize the diffuser. 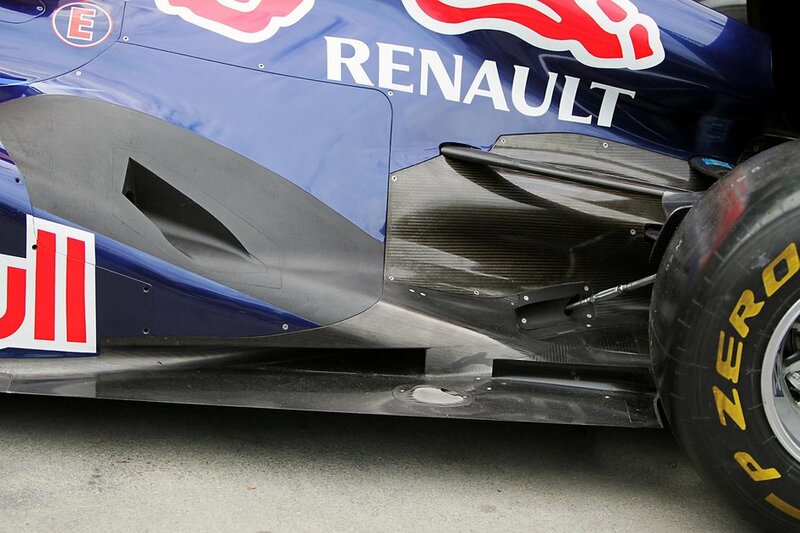 The two larger, forward, round holes appear to run up under the body work, as you can see daylight through them. I havent yet seen a picture of the Valencia bodywork underside to see if there is any channeling on underneath it. But one can assume that Newey hasnt left this area untreated for air management. So, noticing that, noticing the three top floor strakes, and looking at the driveshaft cowling, i am beginning to wonder if Newey is effectively creating a secondary "open diffuser" on the top of the regular diffuser? By using technical elements similar to the way the double diffuser fed through the side of the plank and out through the secondary diffuser previously. Only in this instance it scoops from the sidepod and blows it to the top of existing diffuser tray. I remembered that the LMS cars had a ban on asymmetrical air-foil elements on the front of the cars in the splitter area. Audi found a solution to this with the R15 by running a symmetrical beam wing as a splitter, and by virtue of the ground effect acting on it, it generated downforce, despite its symmetrical profile. If we apply same principal to the cowling on the drive shaft, it could be producing a significant amount of downforce as a secondary function. If the air from the forward scoops is being collected, and accelerated through the rear of the body work (presumably), and we have the exhaust flow being injected into the same area, that creates a large air mass to work with in that area. Now we add the three top mounted strakes to help coral the air on the top of the diffuser tray. Then the driveshaft cowling, which sits directly above said strakes, now acts as a ceiling over the top of the strakes (no different then the road below a diffusers strakes), and the expansion of the air out of this area in effect with the beam wing, and the secondary "turning vane/gurney flap" that Newey has on the leading edge of the diffuser floor, could in essence be a secondary "open diffuser". One that is generated through the sealing of the area via air pressure and exhaust gas, with the coke bottle and the rear wing sideboard sealing it up even further (which would explain the excessive use of flow vis in this area recently). So not only would they be generating downforce from the top of the diffuser, but they would havbe the added benefit, that much like on the R15 symmetrical front splitter, the driveshaft cowling, because of the difference of air speed over the top and bottom of the symmetrical shape, will cause an additional downforce effect, and act as an additional element (one tied directly to the rear wheel), without breaking the rules because it is not an airfoil, but a symmetrical aerodynamic wind defeating element. Sorry if that is way to complicated, or not explained very well, but its late (or early as the case may be here in the US), and my brain isnt quite on all cylinders. But it makes sense to me at the moment. Re-reading this post later today may prove otherwise. Don't worry mate I understand exactly where you're coming from and it is kinda what I'm trying to point people towards with this article. The "holes" in the drive shaft shroud are nothing more than reflections of the strakes below. There are no holes there. Great stuff this. Cannot contribute as I'm just a humble mech eng (CEng). Just watch and learn, Fraser, watch and learn. 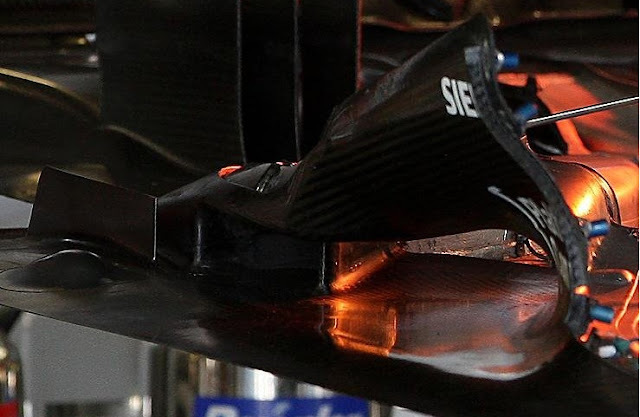 Looking more at the rear end, and examining some other pictures, i noticed that there are two holes off of the trailing edge of the diffuser flap/turning vane. At first i thought it was an anomaly with the picture, but ive seen it on several different rear end shots, and at different angles as well. Im curious to understand why they are there. 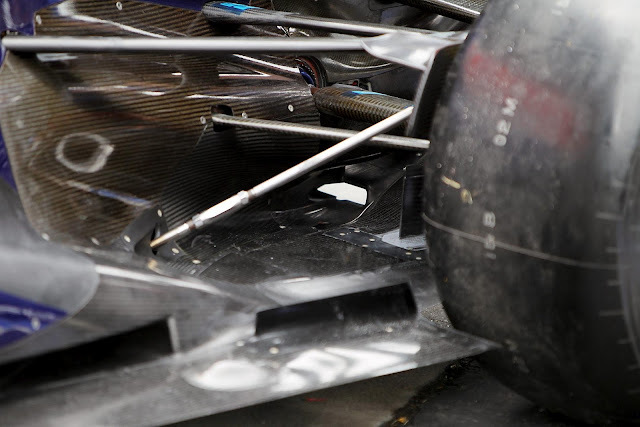 They are in direct alignment with the lower strakes, and right above the U shaped dip in the upper diffuser tray. Best logical guess is that they are being blown (possibly through the small square vents that feed the starter motor hole?) to help prevent attachment of vortices being generated from the U shaped channels that would reduce downforce, and increase drag. Still never cease to be amazed at the level of detail that goes into aerodynamics for the smallest of benefits. From your initial paragraphs description I assume you mean the curvature of the gurney flap at the extremities down onto the diffuser endplates. Ferrari have designed their Gurney Flap in the same way, as the flap is not a rigid component like for example the Caterham one the flap acts like a wing, both creating downforce but not to the extent of stalling the airflow / creating drag. The curvature at the side of the gurney flap simply bleeds the airflow that would normally be pinched and create a vortice if it were to come to a straight edge stop. It should further assist the airflow exiting that channel of the diffuser. Reading the second paragraph however you may be talking about the V grooves in the diffuser and gurney flaps, once again they are there for both drag reduction across the section and airflow injection at those points to pull the airflow along the strakes below. You incorrectly assume the Magnus affect only creates lift also incorrectly assume the Magnus affect creates a thick boundary layer. First study cylinders in flows at different Reynolds numbers, then study the Magnus effect...! The magnus effect by definition creates a boundary layer and I didn't say it only creates lift. I said it 'can' create lift I didn't say that was it's only function. 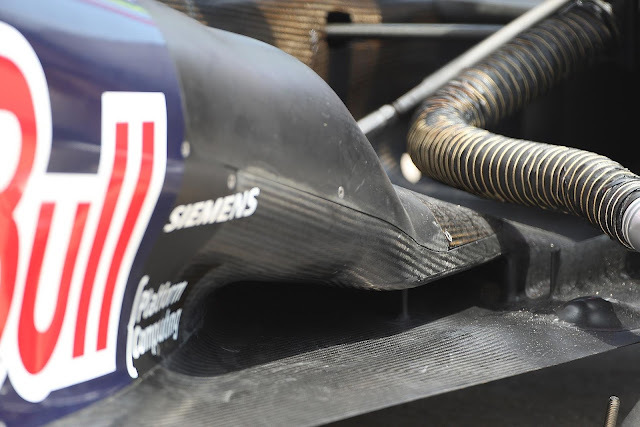 In usual circumstances the driveshaft should create downforce but we aren't dealing with a laminar flow due to the exhaust flows interaction in 2012. This is more likely the reason for Red Bulls adoption of the shroud along with it's purpose of creating interaction with the floor and floor strakes to create a level above the diffuser in which to direct the exhaust plume.